Harris Farm has long been famous for our fresh hand-picked sweet corn, which we have been marketing since the early 1950's. We plant over twenty varieties of Sugar Enhanced and Super Sweet to have a constant supply from mid July through early October at our farm store and Saco Farmers Market. All of our corn is produced using traditional hybrid seed, and NEVER any Genetically Modified Organisms (GMOs). Our corn is available from mid-July through early October and is hand-picked several times throughout the day to ensure freshness. 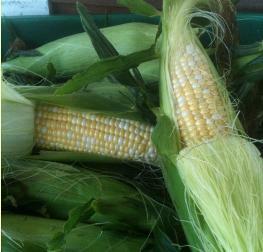 You won't find sweeter, fresher corn anywhere! Enjoy it as-is or with real​ Harris Farm homemade butter!